Hordak is a fictional character in the Masters of the Universe franchise who opposes She-Ra and He-Man, as well as the franchise's main villain, Skeletor, to whom he was once mentor. Hordak is the main antagonist of the She-Ra: Princess of Power cartoon, in which he is the archenemy of She-Ra, He-Man's twin sister. In this series, he rules the planet of Etheria with an army of Horde Troopers, most of whom wear a red bat symbol on their chests to convey their allegiance. According to most story media, Skeletor betrayed Hordak and trapped him in "another dimension" before beginning his own conquest of the planet Eternia. Hordak, not to be outdone, then returned with a vengeance to take over Eternia for himself. Hordak is recognizable by his white (sometimes cream/bone coloured) face, with sharp red eyes, his flat snout-like nose, red fangs and pointed bat-like ears. He wears a collar of bones and black armor over his chest, emblazoned with the Horde bat symbol. His appearance resembles a bat-like creature, although in some media he appears more cyborg-like. Whenever he talks, he pauses his talking by snorting between his statements. According to the toy line's creator Roger Sweet, his face was modelled on an African witch doctor's mask. Hordak and the Evil Horde originally appeared in the Filmation cartoon series She-Ra: Princess of Power. Hordak is the main antagonist of the show, and is portrayed as a ruthless tyrant, who delights in the pain and misery of others, including his own minions. He rules Etheria from his headquarters, the Fright Zone. He has the ability to transform all and/or parts of his body (usually his arm/s) into a wide variety of mechanical weapons and devices, including cannons, rockets, tanks, sawblades, drills and flamethrowers. His powers seem to be derived from a combination of magic and science. Horde Prime, who is possibly his brother, is the evil ruler of the galaxy-spanning Horde Empire. Their home planet is known as Horde World. The Horde employs a vast army of robots, tanks, aircraft, spaceships and other advanced technology to allow them to conquer and enslave planets. An assortment of the most horrible creatures in the universe serve the Horde as the leaders of its robotic army. He also to get revenge on his treacherous former pupil Skeletor. In the new continuity of the 2002 Mike Young Productions He-Man and the Masters of the Universe animated series, Hordak played the role of the ultimate evil in Eternia and the power behind Skeletor. Here, he is depicted as a non-technological sorcerer warlord from ancient Eternia (Preternia), who opposed Castle Grayskull's original ruler, King Grayskull, with a massive army of soldiers, sorcerers, and his original henchmen. The conflict ended when Hordak commanded his sorcerers to draw Castle Grayskull into the dark dimension of Despondos. The spell failed with King Grayskull's intervention, only destroying the area around the castle and drawing Hordak and his army into the dimension instead. However, Hordak's spirit that was ripped from his body managed to mortally wound Grayskull before being imprisoned. While trapped in Despondos, Hordak saved Keldor's life after he failed to assassinate the Eternian Elders, and had acid splashed in his face when it was deflected by Captain Randor. Hordak saved Keldor by magically removing the damaged flesh and altering his body into a more demonic form, leaving him with a skeletal appearance. Having saved his life on the promise of a later price to be paid, Hordak renamed Keldor as Skeletor. It can be noted that Hordak was far more threatening towards his minions than Skeletor was. In the episode "The Power of Grayskull", Hordak completely destroys one of his generals using telepathy simply for giving him good advice that he did not want to hear. At a much later date, Hordak calls upon Skeletor to free him from Despondos, and Skeletor initially seems powerless to resist his mentor. However, Skeletor surprises the onlooking Evil-Lyn and He-Man by defiantly destroying Hordak's temple, thus hoping to seal his former master away forever. Soon after Evil-Lyn attempts to free Hordak through different means with the help of Count Marzo, but after He-Man destroys the Well of Darkness, Marzo absorbs the power of his amulet and flees. It is also revealed that Hordak is responsible for creating this series' Dark Hemisphere on Eternia by performing the Spell of Separation. Hordak was intended to be released in the new toy line, as well as being the main villain in the third season of the cartoon series. 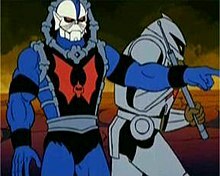 According to Ian Richter of Mattel, who initiated most of the storylines in the cartoon, Hordak was going to conquer Eternia in season three and serve as the main villain of the season before finally being overcome by Skeletor. However, the toy line and cartoon series were both canceled after the show's second season, so the third season was never produced. Hordak serves as the main antagonist of the reboot, She-Ra and the Princesses of Power. This version has him speaking in a clear voice and prefers to keep to himself in the Fright Zone with his presence largely confined to comm-link viewscreens. Furthermore, Hordak is more practical minded in his methods: when told of Adora's disappearance, he orders Shadow Weaver to not bother pursuing her at the advance of the Horde's current objectives while promoting Catra to Force Captain. Furthermore, when Hordak secretly discovers through Imp of Catra and Entrapta's runestone project, he approves of it and authorizes them to requisition any materials necessary, such as the powerful Black Garnet runestone that's in the Horde's possession over the protests of Shadow Weaver. When Catra's attempt to destroy the runestone at Bright Moon fails, he accepts Catra's observation that she came closer to victory than Shadow Weaver or anyone else has ever achieved and appoints her as his new second-in-command. Unlike previous media, Hordak does not learn that Adora and She-Ra are the same person until the tenth episode of the reboot's first season. Hordak and his Evil Horde were incorporated into Mattel's Masters of the Universe toy line in 1985, to reinvigorate the line by introducing a new group of villains as adversaries to both He-Man and Skeletor. Hordak was introduced in the minicomic "Hordak: The Ruthless Leader's Revenge! ", which came packaged with his action figure, in which he returns from the dimension in which he was imprisoned to wreak vengeance on Skeletor, while also making his own attempts to destroy He-Man and conquer Castle Grayskull. His character is presented as a sorcerer who has now turned his attention mainly to science, and uses a combination of magic and science, but mainly the latter, in his attempts on Eternia. He was apparently involved in events in Eternia's past such as the building of The Three Towers, which is alluded to in some of the mini-comics that came packaged with the action figures. A second version of the character, 1986's Hurricane Hordak, with vac-metallized gold armor and an arsenal of spinning weapons, was released as a counterpart to the Flying Fists He-Man and Terror Claws Skeletor figures of the same year. The third action figure of the character, Buzz-Saw Hordak, has become a very rare and sought-after collector's item. This toy's rare existence can be attributed to it being released in 1987, which was toward the end of the toy series original run. The mint condition (known as MOC / Mint on Card) version of this figure can fetch high dollars on auction sites such as eBay. While Hordak came to be generally recognized as She-Ra's main adversary, most story media outside of the cartoon focuses more on Hordak as one of He-Man's arch-enemies. He features predominantly in the Star and Marvel comic series in the US as an enemy of He-Man, and also in the London Editions comics in the UK. London Editions also published a short-lived She-Ra comic series, which also stars Hordak as the main villain, explaining that he divides his time between his rulership on Etheria and his attempts at conquering Eternia. The UK comics also state that there are two Fright Zones that he operates from, one on Etheria and one on Eternia, the latter resembling Mattel's Fright Zone playset. The UK comics state that he comes from the world of Academica, apparently a world dominated by science and industry. In the Filmation series and later comics derived from its continuity, Horde Prime is the only being with authority over Hordak as well as his Horde inspectors, for he is the intergalactic ruler of the Horde Empire, with control over all Horde regimes. He apparently hails from a world known as Horde World although his exact background has never been revealed. All that has ever been seen of Horde Prime is a gigantic skeletal robotic arm, which suggests he may be some sort of cyborg. He travels the universe in his spaceship, the Velvet Glove, keeping watch over the Horde's universal activities. It has been speculated, but never confirmed, that Horde Prime may be Hordak's brother. The main reason for this comes from the episode "The Peril of Whispering Woods", the first She-Ra episode to allude to Horde Prime. In this episode, we see Horde Prime's son, Prince Zed, who addresses Hordak as 'uncle'. This could suggest that Prime is Hordak's brother or brother-in-law, but it is also possible that Zed only called him 'uncle' as a friendly term, or he is on Zed's mother's side. However a letter from this episode said "your nephew" stating that Hordak is his uncle but we don't know on which side. It has not yet been confirmed whether or not Filmation's writers conceived Prime as Hordak's brother. However, he is referred to as such in the Character Profiles in Disc 6 of the She-Ra Season One DVD set. Two UK She-Ra annuals in the mid-1980s state that Hordak is Prime's brother, but these operate within a canon independent of the cartoon and also altered Horde Prime's name, referring to him as 'Prime Horde'. The UK He-Man comics state explicitly in one issue that Horde Prime is not Hordak's brother, but again these operate within an independent canon, and Prime is depicted with a completely different appearance from the cartoon. Hordak features prominently on DC Comics version of Masters of the Universe. In 2008, Mattel debuted the Masters of the Universe Classics (MOTUC) line of action figures. This line was to be sold exclusively on its collector-centered website, mattycollector.com. This line features classic MOTU characters sculpted in an updated style with added articulation by renowned toy sculptors The Four Horsemen. Currently, the MOTUC line has no comprehensive backstory, but the figures' packaging does include short character bios that merge elements from various incarnations of the franchise, as well as some newly developed information to form a new, distinct MOTUC continuity. Hordak's MOTUC bio states that his birth name is Hec-Tor Kur, second-born heir to the Horde Empire, who came to Eternia while battling He-Ro. Hec-Tor adopted the name "Hordak" and eventually raised an army to battle against the Snake Men for rule over Eternia. Eventually, Hordak's army defeated the Snake Men, but it was then defeated by King Grayskull, who banished Hordak to the dimension of Despondos. The official product description also refers to him as Hordak's brother. In the Filmation series, Hordak possesses an array of powers. Unlike his treacherous former pupil Skeletor, who relies mostly on magic, the majority of Hordak's powers are seemingly the product of science. He is capable of transforming himself in a variety of ways. For example, he can turn his arm into an energy cannon, become a massive tank, and even transport himself over great distances by becoming a rocket. In the episode "The Stone in the Sword", Hordak even transforms his arm into a vacuum cleaner. Although mechanical in result, these transformations may have been magically instigated, as they occur instantaneously with an eerie glow and sound effect. However, the minicomics and Marvel Star comic books depict Hordak as using magic to a greater extent, more so than science. He is shown to be a powerful dark mage of equal or greater power to Skeletor and most likely has far greater knowledge. As was the case with Skeletor and He-Man, Hordak received later action-figure iterations that had new special features. As Hurricane Hordak, he has the power to discharge violent whirlwinds via mechanical rotor-blades that replace his right hand. As Buzz-Saw Hordak, he can launch a deadly spinning buzz-saw-like projectile from his chest. The accompanying minicomics explain the origins of both seemingly technological powers in clearly magical terms. In the 2018 Netflix/DreamWorks reboot, Hordak is extremely intelligent, stated to have "a brilliant, technological mind". He also wears a First Ones highly tech-powered armor which gives him superhuman strength. In February 2017, Comic Book Resources listed the character as "He-Man: Eternia’s 15 Mightiest Villains". 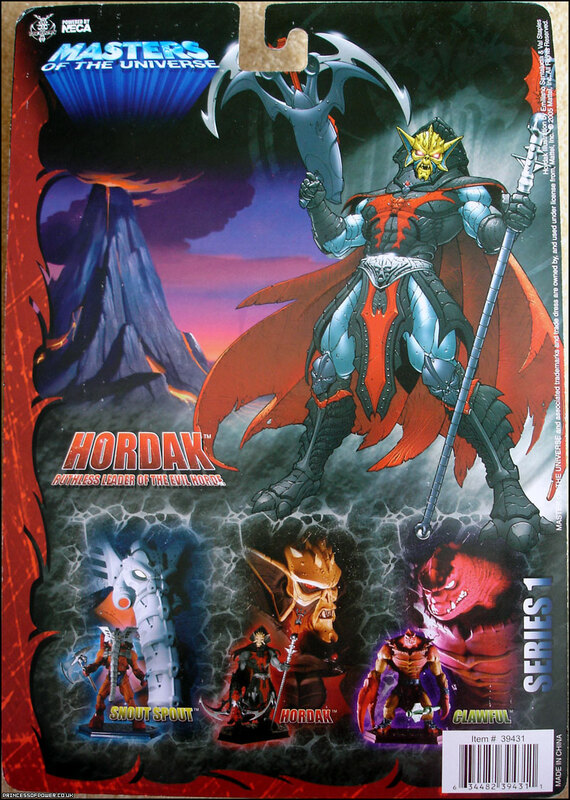 ^ "2009 Hordak action figure box back". I.toynewsi.com. Archived from the original on 2009-05-10. Retrieved 2009-08-29. ^ "The Best of She-Ra: Princess of Power Review". IGN. Retrieved 2009-09-21. ^ "She-Ra's Second Due in Sept". Animation Magazine. Retrieved 2010-03-07. ^ "2000s-era design art". Princessofpower.co.uk. Archived from the original on 2011-08-25. Retrieved 2009-08-29. ^ "Pop Culture Network". Popculturenetwork.com. Retrieved 2013-10-18. ^ "Ian Richter's answers to fan question revealed! Please discuss in this thread..." He-man.org. Retrieved 2009-05-08. ^ "MTV Geek – Exclusive: 'Masters of the Universe: The Origin of Hordak' #1 Preview". Geek-news.mtv.com. 2013-06-12. Retrieved 2013-10-19. ^ "DC Comics Reveals He-Man: The Eternity War". IGN. Retrieved 2 December 2014. ^ "Abnett, Mhan Wage "He-Man: The Eternity War" in December - Comic Book Resources". Comicbookresources.com. Retrieved 2 December 2014. ^ Nigel Mitchell (11 February 2017). "He-Man: Eternia's 15 Mightiest Villains". Comic Book Resources. Retrieved 13 February 2017.